Behind these questions, the patient holds the emotional burdens of uncertainty, apprehension, anxiety and anguish. It is all about the fear of the unknown and, whether realistically based or not, the unknown is anticipated by the patient as life threatening or impairing their quality of life. The duty of the physician is to not only make the diagnosis and establish the treatment but also to treat the patient’s emotional burdens. There is a need for the doctor first to recognize that these burdens exist within the patient. Part of the approach would be to make the diagnosis quickly, if that is possible, but beyond that, what else should the doctor do? I look to my visitors to give us their personal experience and insight of how their physician dealt with the issue of the unknown diagnosis and the anxious patient. ..Maurice. Is Ethical Behavior Something to Learn or Something to Preserve? Do ethicists, expounding ethical norms, truly expect the result to be improvement of the ethical behavior of their listener? If an ethics workshop is designed to teach ethical behavior, do those attending go away a bit more ethical? How do people, who do ethics or hear ethics pronouncements, become more ethical? Are ethicists themselves any more ethical than others in society? Gordon Marino, a professor of philosophy writing in the Chronicle Review tackles this subject fairly nicely including a few personal examples. Go to the above link and read Marino’s thoughts and then come back and write your comments on the subject. I might also wonder whether this bioethics blog which is providing a resource for ethics thought and discussion will make my visitors a bit more ethical. Or is ethical behavior something which we are all born with, like so many other things that are built into us when we come into this world and that our task is to think about preserving this quality as we face the many and various challenges in life where ethical behavior could be degraded or ignored by narrow minded thinking and self-interest? What do you think? ..Maurice. An issue which was discussed on my now inactive "Bioethics Discussion Pages" was about whether there is a limit to the information which should be disclosed to the patient when the physician is attempting to get informed consent from a patient for a medically established essential treatment or procedure and where the patient may make a wrong decision because of the possible consequences of too much knowledge. The responses of my visitors are pasted below with the most recent at the top of the thread. Although many are strongly against any withholding of information, it is also noted that severe risks including death even though rare may be acceptable to the patient by the way the physician tells the information and the trust the patient holds with that physician. What do you think? ..Maurice. "I feel that the process of informed consent is not always in the patient's best interests. Many patients clearly need cardiac cath [heart catheterization] and initially agree. But once I inform of the risks of the procedure, they then refuse. Even when I subsequently inform them that the risks of not doing the procedure is far greater, they persist in their refusal. Thus the process of informed consent has caused the patient to act in a manner deleterious to their health. Many patients cannot understand the concept of risk/benefit ratios. I understand that we wish to avoid medical paternalism and promote patient independance (and avoid lawsuits) but medical decision making is not the same as a consumer pulling products off a store shelf. Part of what the patient is paying for is our professional judgement (hopefully not influenced by financial considerations). Should medicine and society agree that in certains situations a procedure is so clearly needed that the physician may choose not to inform the patient of the complication rate? For example, an otherwise healthy 60 year old with a normal LV [heart function] who has a 90% [narrowing] left main [coronary artery] (10% mortality/year) who needs CABG [coronary artery bypass graft] (2% mortality at one point in time). Could we skip telling him he may die from the procedure and simply recommend he have it?" Do you think that if the general consensus of medicine and society is such that a certain medical procedure is clearly needed to save the life of a patient with a specific condition and that the risks of death from the procedure are so small compared to the risks of not having the procedure that the physician may choose not to disclose that procedure risk in order not to unduly frighten the patient into making a wrong decision? Simply put, all healthcare providers should adequately advise patients of all information to any procedure whether large or small. In too many cases, the doctors have been in a rush to see other patients as a quota is met daily, thereby assuming they've informed a patient of risks involved with surgeries when they have not. All to often when this occurs as in my situation, the doctors as well as the administrators avoid the true issue of your complaint and false papers are drawn with signatures of doctors not visited with on the dated days and time. It would be very advisible for the patient if possible to have a witness on his/her behalf to verify whether the patient was advised of risks involved with surgeries as well as that of signing an "informed consent" in front of the witness and obtaining a copy of said consent that day. I agree with responses you have received regarding the patient's right to know. One of the dangers in not informing a patient of the 2% mortality risk from surgery lies in whether the patient becomes a part of that 2% - let's set aside the legal risks, which are not nearly as important as the ethical ones ... the patient has the right to choose to take his/her chances with the 10% mortality from his/her current condition. While important in medical decision making, remember that to our patients, these are just numbers. However, I understand your point about some patient's inability to comprehend risk benefit ratio. While this does not negate the patient's competence to make his/her own decision, it does reveal an opportunity for improvement in our healthcare system. In an ideal world, physicians & other caregivers would assess the patient's learning and adjust the education accordingly until the patient understands the basic concepts, using diagrams, charts, posters, models, etc. However, the current health care system lacks the resources to devote this amount of time to education of our patients. In addition, I think it important to point out that the goal of some (?many) "informed consent" discussions is to get a signature on a form, rather than to really inform the patient. While we think we know best, sometimes this is not what is best for an individual patient - they have to decide for themselves. It seems to me a better idea to have the target patient tested by a psychological questionaire before the doctor decide something crucial. There is more to the process of informing the patient than just giving statistics. First, the educational and learning level of the patient should be determined. Second, what and how much information the patient wants to know shold be determined. I have run across a patient who absolutely did not want to know any information about his procedure. If this is the case, documentation should confirm the and probably witnessed. If a physician was to perform a procedure on me without informing me of all information, because the physician thought it was in my best interest, I would feel he thought he was better than me. I would probably ask him the question, "You mad you God?" Legally, I feel if the patient has been properly informed, the physician can not be held liable for the patient's decision. But if the patient is no informed and something happens, then they may be subject to a lawsuit. I believe that no matter what the consequences are of informing a patient of everything, the patient has the right to know. If a patient is going through a procedure, he or she needs to be educated about everything involved. If the patient does not have all of the information, he or she can not make a decision clearly knowing they knew everything. The original doctor's response about the experience he (she?) has "should win the day" since patients do not have that medical base or knowledge. The arrogance of that "answer" just overwhelms me. The IOM's report that doctors and hospitals kill 98,000 people a year (maybe many more) should dispell any "call to authority" on the physician's part. Good decision or bad, it's the patient's body. Thus, it's their decision. Why is it so hard for some doctors to accept the fact that a patient, although perhaps lacking (somewhat) an expertise in general medical knowledge, many times has a larger specific medical knowledge base of their own medical condition(s) that is much better than the doctor's! I've had physicians tell me that I am very well informed about any of my "medical conditions" and how they appreciate this. What they were telling me is I, being a pro-active patient and advocate regarding my personal health care, help them to help us make a MUTUALLY agreed upon plan of action (fully consented to by me!) to remedy any illness that may have befallen me. We use each other's "expertise" to arrive at a treatment that benefits me and adds to the doctor's own medical knowledge base. I truly think that this has helped me and my personal physicians to enjoy a truly great professional relationship over the years that has been mutually very satisfactory. I've also participated in a clinical trial. Consent was very important to the researchers and I certainly appreciated their concern that I know "what was going on!" I asked questions and even visited the lab where the experimental medication was developed and produced. The saddest comment came from a researcher on the project who told me I was the only one who asked so many questions and the only one who "visited" the lab! Patients have obligations concerning their health and welfare too! Patients have to advocate for themselves and tell all healthcare workers consent is of utmost importance to them. I truly liked the experience of being a "teacher" (not a "tool!") to medical researchers on the clinical trial. Belonging to a patient advocacy group, I am keenly aware that informed consent is the very foundation of a good working relationship between patient and doctor. Nothing else will suffice. Consent brings respect, beneficience, good treatment plans, knowledge, patient compliance, and a whole host of other advantages for patients and doctors. Hiding information from patients? Doctors who do that should never be allowed practice medicine anytime or anywhere! It is very difficult for a patient to make decissions that may affect their life or the life of their loved ones. At times, I feel that some patients just want the doctor to tell them the best thing to do. Well, i think that the person still needs to know that they might die and needs to discuss it with his/her family because no matter how small the risk is, it still exists. MY question: What do you tell the patient's family when he/she becomes part of the 2% that dies, while they were not made aware of the risks involved and you simply told them he/she had to have the procedure done. No way. It would be completely unethical and illegal not to inform a patient properly and make them undergo a procedure such as catheterization, carrying so grave risks!! It is not only HEALTH that the doctor is cound to care for, it is also, and primarily PEOPLE'S CHOICES, people's freedom. It is your business as doctors to try and EXPLAIN why you believe so much in procedures, and afterwards, if the patient does not want them, then this is not your problem, it is theirs. After all what would you do, if you omit information, put ignorant patients into procedures and then the risks materialize, as they indeed might? This is a crime. So, SEE that your job is good technical medical practice 50% and good explanations 50% TOO. The issue of discussing risk with patients centre's on informed consent. Each party to the treatment decision views risks and benefits very differently. Doctors may view the risk of treatment as small when the risk of the patient not having treatment appears to be so great. The hypothetical doctors statement "There an 80% chance of dying in the next 5 years compared with a less than 2% chance of death from the procedure" could lead the patient to think, "I have a 2% chance of dying from this treatment but may not die in the next 5 years." If a patient withholds consent for treatment that is his / her prerogative. The doctors' role is to help the patient exercise that prerogative by informed consent. The treatment decision has to be a partnership decision between the doctor willing and able to carryout and the patient willing to undergo the procedure. The point of decision comes when both parties accept their role and responsibilities. To accept responsibility the patient must: 1.. know what the procedure is 2.. understand the procedure and treatment process 3.. know, understand and accept the risks involved in the treatment. Informed consent should aim to provide the patient with sufficient information to make decisions; this means providing enough good quality information for the patient to be able to (as far as possible) validate the decision in his / her own mind. Withholding information because the doctor feels the patient may not agree to treatment is not a good basis for confident decision-making and certainly is not an informed basis for a decision. The patient must be the final arbiter as to whether treatment is necessary, appropriate and worth the risk. Should the doctor choose not to disclose procedural risk? No. Informed consent is a double edged sword, but highly necessary none the least. In my short experience to date dealing with terminal cancer patients, it amazes me how they will blindly follow a doctors recommendations and go under the knife, or submit to some grueling chemo experiment with limited potential for success. However, when apprised by a layman demonstrating double and triple the success rate of conventional modalities, the patient will not follow through this process. They chose less odds and more anguish over a much simpler nutrition process and other remedial routines. Sometimes too much information leads to confusion and a bad decision, so perhaps some discretion should be allowed. After all, does your car have a warning label that says you could get killed in an accident driving two blocks or two thousand miles from home? The odds are the same, but you do have a choice to buckle up, or to not even drive. The ugly required warning label on your visor tells you about seat belt safety. What's next, the car won't start without fastening the set belt? The risk of death is all around us in everything we do, so should that risk of death be overemphasized in an informed consent session. No, it should be relative to the risk. Taking aspirin or vitamins might kill you, perhaps not from the ingredients, but from a heart attack by choking on the pills. Does product labeling require the risk of death be listed or emphasized? No. However, plastic bags are required to be labeled that suffocation might occur. Is it that stupidity abounds in society that requires this label? If that were the case, why not label it in many languages so that a foreigner not literate in English might be able to read it. They might put it over their head. Common knowledge has been supplanted by liability issues so much, that everyone is to be considered stupid. That the manufacturer is held liable even if the user uses the product incorrectly. The point here is that we have gone overboard in many of the labels and/or informed consent practices due to the liability issues and a litigation oriented society. Informed consent is a good aspect of medicine that needs to be tempered with the appropriate situations. As one person responded, it is not the information that is provided, it is how it is provided that makes the ultimate difference. The real loss is the loss of substantive patient/doctor relationships of yesteryear. A return to those days would help alleviate a lot of today's problems in medical administration. I just came across your article and question as I was preparing a presentation on Informed Consent. I do not feel that the doctor or the lawyer or the social worker should decide what is good for the patient. We go to the above professionals to seek their professional advice and once we receive the advice we are free to use or not use . The right to make a decision relative to ones well being must be protected even if the decision that is made may have dire consequences. The patient, assuming rationality, has the last word re the treatment. Informed consent as a process should be seen as an educational tool as well as a decision making predicate. When the patient can no longer make his/her own rational decisions, then hopefull he/she has prepared a durable power of attorney giving the decision making power to someone he/she trusts and who has the patient's well being high on the priority list. When my 16 year old daughter had a baby last July 29, 2001, a nurse came in the room at 4 am (3 hours after my daughter giving birth and while still drugged) and woke her up to sign a paper. She did so never really knowing what she signed, just signing because she was groggy, still drugged, and because she was "supposed to". The next day we found out that the baby had recieved a Hep B shot and we asked how can you do that without consent? We do not believe in immunizations! They explained they came in at 4 am and she signed. I asked how in the hell is that INFORMED CONSENT? Seems more like By SNEAK & TRICK Consent! They sent in a DR. and I clearly explained that myriad reasons why we were opposed to immunizations and the stupid cow dr kept telling me how I was stupid to think a bit of mercury in the vaccines were harmful and that they didn't have mercury in vaccines anymore, (NOT SO! They still have many lots of vaccines containing Mercury in them that they are trying to use up!) and that all of my other beliefs including religious were dumb and outmoded and that I was old fashioned and so on and so forth. How dare this so called dr. tell me I am stupid in my knowledge of vaccines when I have been researching this for 3 years ? I bet you everything I own that I have researched 200% or more than she has in this area. How the hell is she gonna attack me personally? I have never been so pissed in my entire life. She acted as if she would never get paid as a dr if she didnt convince me that I was wrong and she was right. My 2 year old grand daughter has NEVER had an immunization in her life. She is the epitome of health. She has never been to the doctor except for one time when a mild virus caused her to become dehydrated and she was seen to be rehydrated. No ear infections, cavaties or other common childhood maladies. I believe it is attributed to breast milk, no immunizations, and eating whole foods (no artificially added sugar for this kid!) She comes to my work and did so daily the first year of life which is at a large community center in the inner city. She has been exposed to tons of germs and tons of children who have been immunized and not immunized. Two children who were born within a month of her and who also come to work with my boss have had all shots as scheduled. They have been chronically ill with colds, viruses, respiratory problems, ear infections, overweight, RSV, etc since birth. My grand daughter plays with them, eats and drinks after them, and yet, doesn't seem to catch their illnesses. Hmmm.... So much for immunizations being such a wonder drug! Yet this stupid dr had the nerve to call me stupid! How many kids has she tracked to see what effect having immunizations or not having immunizations actually have? It is counterproductive to castigate the patient or the patients family! It only serves to more firmly entrench one in ther personal beliefs! When a doctor truly feels the patient is making the wrong choice, once he has given risks, benefits and options available to his patient, his only recourse is to offer availability of his knowledge should the patient decide to learn more. That is it. It IS MY CHOICE! Just because a treatment exists doesn't mean I have to choose it! The trade off may not justify the ends to me. How would you like someone to make your decisions for you? I promise you most people in the US would fight such a tactic and rightly so. If I choose to not take insulin someday when glyburide and diet and exercise no longer work for me, then that is my choice. Just because insulin exists I am not obligated to use it. I may decide to pray or take vitamins or a host of other choices. And I promise you, if ANY Dr. EVER does something to me without my consent, I will likewise do something to that Dr. without that Dr's consent. Eye for an eye! Dr's are there to diagnose, ADVISE and treat WHEN ASKED . Not to personally choose and decide. That is for the patient. "Nuff said. No!! I understand your frustration but it will take time to educate people about understanding risks and benefits calculations after years of paternalistic medicine. You are asking for a law suit if you do not disclose people's rights to choose -even to choose badly based on personal calculations and experiences that you have no idea of.... Your job is to educate not coerce patients. Good luck. There is even more to informed consent than what is listed and considered: Whether or not the surgeon /physician is available postoperatively? What medications will be used and their possible side effects? What are the potential adverse reactions? Will these be monitored? How carefully will these be monitored? Heparin is a case in point. Even the corner drugstore takes the time to tell of possible side effects and to provide a written sheet detailing this information. It should not be otherwise in our medical facilities and our medical professionals in whom we place our faith and trust. A patient must have all information/facts that impact on his or her health and well being to be informed - withholding them is not only dishonest and unethical it is criminal. Dear Dr. Bernstein, I visited your site because I am looking for information. I have been through quite a few surgeries and have developed severe anxiety about dealing with any more..it's like having post trometic symdrome. I can't find anything on the net about being so afraid of procedures. I have Diabetes type 2, HBP, ect. and now must see a Endocrinologist. More blood tests, more meds more everything! It's not the pain, it's the loss of self, the right to choose for myself what I will and won't allow. It's the clinical disregard for my feelings or modesty. (I am talking about people walking in or leaving doors open..ect.) I am tired of being told I am a baby or being threated with holding me down for a shot or I.V. (which has happened more then once, holding me down I mean) It's also the attitude of the health care providers that "it's just routine" "SOP"..for them,not for me. I read with interest the artical on imformed concent. What concent? When? Maybe in your world. I recently had a bout of costochondritis, I thought I was having a heart attact (my lipid level is 3,400, the Dr. said I have to watch for HA's) The E.R. DR. decided it was costo and said he wanted a blood test to be sure..I told the nurse I didn't want an I.V. because the "cure" for costo was motrin.I said this 3 times. He said I have to draw blood and stuck an I.V. in. So much for Patients bill of rights. Then the admin came in with the concent forms a half hour later. I will now refuse all invasive treatment. Thanks to the Dr.s who treated me like a child (I am 50) and did whatever they wanted once I was out. (total Hysterectomy, when I went in for bladder repair..no cancer was found. My appendix was removed when I had my tubes tied, I happened to read my chart, he wasn't going to tell me) The only "Informed" I got was a bill. Everyone has different values. People choose to take or not take risks depending on what is important to them. Doctors are trained to save lives at all costs. That is their priority. Patients ( people) have a right to decide for themselves. To take away someone's right to decision making about their own bodies whether that decision is right or wrong in your eyes is THEIR CHOICE. You are not responsible for the choices they make but you are responsible for ensuring that you take time to communicate the risks and CHOICES available to them. This is your duty of care. The rest is up to the patient. I found this website today whilst "surfing the net" trying to find out about public opinion regarding informed consent, which I am planning to research. I was very interested in your letter and excited to see so many responses to it. However, it seems that somehow people have failed to understand some of the detail of what you were saying. 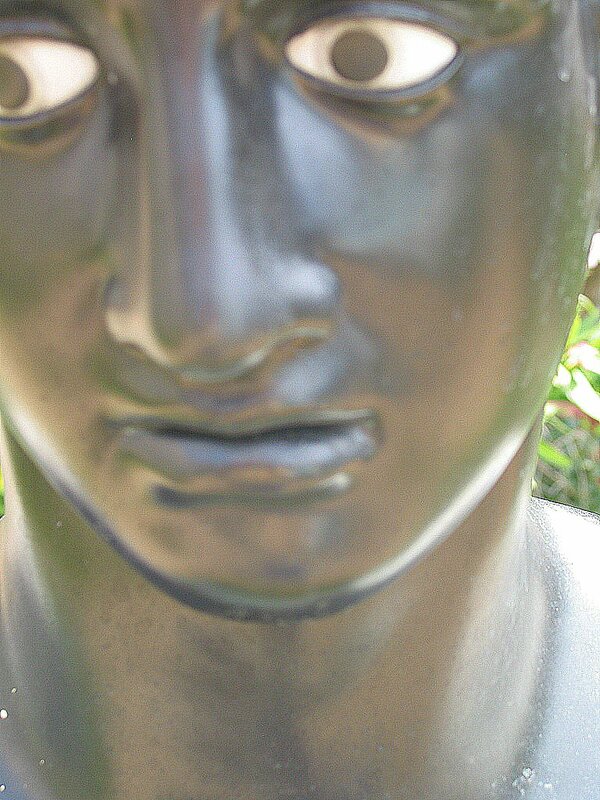 Of course patients should be told of the potential risks and benefits of their operations in order for them to be able to make informed decisions and research has shown that giving patients information regarding possible outcomes both positive and negative does not increase patient anxiety, infact lack of information is often associated with increased anxiety. However, if every single plausible risk for every intervention were to be stated even the most intelligent of people would find the risks and benefits impossible to weigh up. Infact, every change in medication would have to be explained and consented for in a similar way and even simple investigations such as blood tests and chest x-rays would need individual explanation. I am NOT in any way against informed consent - I think it is a very very important part of any doctor patient relationship, and people who feel they have been given all the information they desire and have been given the opportunity to choose for themselves have been shown to be more satified with their health and have subjectively recovered more quickly. HOWEVER, as with everything in life, and medicine, there cannot be one simple answer to this question. I believe that just as giving no information would be totally unethical, so too would it be cruel to subject all patients to all information - to some extent the amount a patient wants to know has got to be tailored to the patient, and thus people need to feel able to communicate with their doctors and ask to be told (or not to be told) more information. As for doctors acting like god, I don't know which hospitals or doctors this is referring to, but as a blanket statement it is totally ridiculous. I have seen very little evidence of anything of the sort, and although some doctors do appear hassled, unapproachable and occasionally unfriendly never have I ever seen a doctor do anything but try and help their patients. I am NOT A DOCTOR (but hopefully one day will be) and although I realise that there are some terrible cases shown in the press and a less than satisfied patient is not uncommon, NO positive cases are ever discussed or ever reported in the news and people seem determined to forget the hundreds of patients saved every day by doctors devoting their lives to help others. Maybe they are proud of what they do, but SURELY with the awful hours, the constant criticism and lack of appreciation a doctor generally gets, he/she should be allowed to be a little bit pleased when they save so many people and improve so many people's quality of life. Sorry I've gone on for so long, but I find it very hard to stop when am passionate about something, and medicine is certainly one of those things. I haven't read the other respones yet, but in order to answer this question a phytsician should consider the priciple of benefiicience ( i.e that one should act in a way that promotes the patient's good) but this is a very complicated question. We can't simplt attempt to make some sort of generalizations towards this because many difficulties become sitiuation-specific and sometimes ruin all that the generalizations had planned because of extra complications. I just would like to point out for now that if one does not give the patient full information he(like a pure act-utilitarian) assumes he can tell the future properly enough, and that he is able to calculate all the benefits and possible risks and gains in a satisfactory way. Now, Satisfactory to whom ? The patient may make a decision that seems contradictory to the physician or self-defeating , but it may just be case where both individuals simpoly have different and distinct methods and values for weighing such things. Note : I am discussing this for a case in which a patient is clearly competent (although this should be defined). And a seemingly conflicting decision may only be the result of a different rationale on the paret of the patient. This is all for now bye. My collegue and I think a patient should know about all risks for any procedure from a throat culture to open heart surgery. In nursing school we study The Code for Nurses which is the ANA guide on ethical issues. "The nurse acts to safeguard the client and the public when health care and safety are affected by the incompetent, unethical, or illegal practice of any person." This, we interpreted to mean that nurses have a duty as patient advocates. We are frequent cosigners of Informed Consent and it would be our responsibility to assure that a patient was informed of all risks involved, whether it was a tiny risk or a life threatening risk. If not disclosing the risks is a common practice for doctors, thank god for nurses. On the issue of informed consent, let me give you an example of a situation. A neurosurgeon recommends to a patient that he undergo back surgery, which he tells the patient is a big and serious surgery, which includes several laminectomies, formanotamies, fusion and fixation with pedicle screws and rods--very extensive surgery. However, the neurosurgeon has monocular vision, essentially does not have vision in his right eye and lacks color perception in the left eye, the eye he can see out of. Don't you believe it is the patient's right to have this information about the physician in order to be fully informed about the risks and benefits of such a surgery, especially in the hands of a doctor with such deficits? There is never an excuse for failing to state the risk because people are used to assessing risks -driving fast cars, eating or drinking to excess , smoking cigarettes etc every day of their lives. If the treatment is for the benefit of the patient, in the interest of the patient and for the well-being of the same patient; It's best to seek and have their informed consent, rather than impose the practitioner's (physician's) wish or will, under the disguise that patient's client's interest is more paramount. Such act of doing something against the wish of a legal entity, constitute an abuse of power, trespass on their person, betrayal of thrust, and may be, turning the patient to "human guinea pig"; all that is contrary to established constitution and law. What, if the treatment goes wrong? Then, comes the scrutinisation of the whole treatment and the physician; Investigations will probably suggest that there are other underlying factors and issues in such a decision, as may later be discovered to be true. "Sometimes our contemporary notions of informed consent, important though they are, interfere with a doctor's capacity to offer hope and comfort. 'When, for example, a patient who is about to undergo a straight-forward surgical procedure anxiuosly asks the surgeon,'Doctor, am I going to make it?' what should the surgeon say?' asks Walter Brown. 'Traditionally, the response would be to encourage the patient:'You're in good hands here, everything wil be fine.' Yet I have posed this scenario to a variety of physicians, both residents and attendings, and found that some consider themselves obligated to list the possible complications and risk of death, even if the morality rate from the procedure in miniscule.' Medical training that (rightly) values precise expression and a culture that values full disclosure and protection from liability may spur doctors to tell their patients the uninflected and deflating truths even in the most dire circumstances. But surely telling the whole truth and nothing but the truth is not the most humane or practical of counsel for doctors. Someone I know of, a physician herself, was recently operated on for a brain tumor. Her doctor chose his first postop visit in the hospital to tell her she would never work again. It didn't help her recovery much." Reading the responses to my original posting, I realized that I failed to make my point clearly. My point was that the process of informed consent has risks in and of itself and that these risks should be considered in discussions of the informed consent process. I was not, as most of the respondents assumed, arguing against the process of informed consent. This same NYT article made an interesting point about another, related topic-that of patients doing internet research and doing their own medical decision making in lieu of following a doctor's advice. It recounts the bout of Franz Ingelfinger, former editor of the New England Journal of Medicine, with esophageal cancer. He himself was a gastroenetrologist. He studied all relevant info from the literature and colleagues to make his own treatment decision. This resulted, he wrote, in he and his family becoming "increasingly confused and emotionally distraught. Finally when the pangs of indecision had become nearly intolerable, one wise physician friend said, 'What you need is a doctor.' He was telling me to forget the information I was receiving from many quarters, and to seek instead a person who would dominate, who would tell me what to do." When he found that person, Ingelfinger felt an "immediate and immense relief." I recently recommended a pacemaker to a patient of mine and explained the risks and benefits of the procedure. He informed me he will do his own internet research which will include a study of the electronics embedded within the pacemaker and how the wires are constructed in order to make an "informed decision." He rejected my opinion that this detailed mechanistic information was not relavent to the process of weighing the risks and benefits of the procedure. My addition to Talbot's and Ingelfinger's point is that internet research may allow a patient to acquire the same database the doctor has-or perhaps one even better. But the patient will not have the doctor's years of experience needed to translate that data into the best recommendation. What makes an attending physician superior to a medical student or resident is often this experience, not a greater body of knowledge. The question of paying for the Doctor's best judgment is the crux of the question, in my humble opinion. We would have to have a tremendous amount of trust in the Doctor's abilities in order to feel comfortable with his best judgment. Granted, he/she is trying to look out for the patients best interests but when the Doctor has not built a trusting relationship with the patient, when they seem to care so little about the patient, then the patient will feel it necessary to "take control" and try to make their own decision. Perhaps the medical profession needs to rebuild that lost sense of trust rather than deciding ( in their own best judgment) to leave out pertinent information when discussing risks. Whilst I would initially agree that a doctor can make a far better informed judgement than his/her client can, this should in no way detract from the clients right to autonomy in making the final decision. Even if a practitioner feels that the client is making the wrong choice, it is still the clients choice to make. my life is mine to live and mine to die---the idea that a doktor would withhold info. from me---even for my benefit---- makes me want to call myl lawyer and sue a medical ''professonal''----how about this?---i gave up long ago trusting any doktor----death is much preferred to being interned ina ritualistic dogmatic hospital much less having a cardiac catheter---i study ethics and medicine now instead ---- the more you know about your enemy the better chance you have of sucess---never call me or anyone i know a patient!!!!!!!! There is no question in my mind that INFORMED CONSENT is paramount to the physician-patient relationship. Aside form a basic TRUST issue, the is the issue of the proverbial "line in the sand" - who will decide how much ought to be told and who will be the watch dog? Informed consent is a right given to us by the constitution. We as Americans have a right to make our own decisions regarding our health care. However, doctors and other health care professionals have a responsiblity to give the best care possible to all of their patients. The line between the two is very fine.I believe that if a person is told of all options and risks regarding their health care they can make a decision on which form of treatment they want. However, this decision can only be made if the person is of sound mind and judgement. If a person does not understand that the risks from not recieving a procedure outweigh the risks from recieving the treatment or by not recieving a treatment the person will die or be left uncapable of living a normal life. The doctor can step in and take the responsibility of giving the care needed. My answer: The doctor must not withold information. Freedom to choose is the fundamental human right, even freedom to choose wrongly. To decide what information to withold is paternalistic, period! Quality of life is more important than quantity of life. Without freedom to choose, we can not have the quality of life that is our inalienable right. We are just learning to trust the marketplace, we must do so also for the marketplace of ethics and philosophy. Doctors have gotten way too arrogant. They are trained and conditioned to think of themselves as Mr. God Jr. This means they are ""cruising for a bruising". They are poised to be knocked off of their pedestal and reduced to working for chickens once again. Believe me!! Power corrupts, absolute power corrupts absolutely, and we happen to be living in an age when people have foolishly turned the decision making over to doctors, rather than take responsibility for their own lives, and it has thoroughly corrupted physicians. The ecology of the medical environment is ready for a DRAMATIC CORRECTION [as stock market analysts are wont to say]. I believe citizens who love liberty are entitled to, ie will make themselves entitled to, maximum freedom to choose all the details of their physical destiny, and can be trusted to do so [you should listen in to an internet listserve support group some time - those people are genuine, increasingly well informed and shrewed. They will be an ever increasing force to be reckoned with]. I feel as a patient advocate that a patient has the right to make an informed decision. I feel with the right information being shared with the patient and family the correct decision will be made. Education is the key point. The respect for persons ascribed by American Nursing Association and California Nursing Association is that of a nurse being a true advocate for a patient is to respect their wishes after being informed. In Texas, we have a list of the procedures which require informed consent. The procedures not on that list do not require informed consent. The list is derived by physicians and lawmakers. Possibly, an improvement to this might include the frequency of complications. The risk of not having the procedure is explained by the physician. A certain element of trust is involved here. The patient must trust your decision. This trust is established by rapport in the physician-patient relationship which is influenced by the physician's bedside manner, the personality of the patient, and family and cultural considerations. The reputation of the physician and facility are also brought into play. Informed consent is an opportunity for the physician and patient to discuss the procedure, including its risks and its benefits. If the patient does not trust the physician's judgement that the benefits outweigh the risks or the patient does not adequately understand the procedure, its necessity,or the attendant risks, the time for the physician to know is before the procedure. There are instances also when a competent individual may decide that he or she does not want to undergo the discomfort of a diagnostic procedure or the treatments which the procedure would indicate necessary, eg. if a cardiac cath is being performed to determine the suitability for an aortocoronary bypass graft and the patient does not want this surgery, then what would be the utility for the patient to undergo the diagnostic procedure? In the competent patient there is no other rational choice to be made. To deny one persons humanity is to deny your own. I do not feel, under any circumstance, that a physician should withhold the possible risks of a procedure to prevent the patient from making the "wrong" decision. It is the patient who best knows what the right decision is, regarding his/her care. It is the physician's responsibility to be as persuasive as possible in the decision making process regarding the patient's treatment. As a radiographer performing angiographic procedures in the 70's and 80's, I accompanied many radiologists to patients bedsides to obtain the patients consent. Overall I feel it is the attitude of the physician and the manner in which the information is presented that ultimately leads the patient to their decision. I have seen many physicians win the patients trust while informing them of the risks, simply by the manner of their delivery. I have also seen physicians inform patients in such a way that I thought that the patients refusal was their goal. In the end the autonomy of the patient is most important. Paternalism, although well intentioned, still negates a basic human right and should not be tolerated. While I agree that certain aspects of informing the patient of the risks involved can create anxiety for them, as a nurse I have observed that the technique of explaining, the approach a physician uses can either make the anxiety worse, or diminish it. I do feel it is vital that the patient, once deemed able to understand what is explained to him, should be allowed to make an "informed" decision. Who are we to make the decision whether this patient wants to take those risks or not? And quite frankly, while some physician's judgement can be trusted, other can not. Physician must say everything to their patients who can choose the theraphy among those proposed. Physicina choose only the right tecnology. Asking the patient to consent to a procedure that carries a risk of death, no matter how nominal the risk, is asking the patient to make a life or death decision. How do we ask the patient to make this kind of decision without knowing that death is a risk. We cannot eliminate it from the informed consent process. Ditto to every comment below (so far!). One need only read/listen to the story of Dax Cowart and shudder about health care professionals who claim to be acting in the best interests of the patient. - Dax Cowart was a burn victim who immediately following the accident and for several months after, pleaded to his doctors that he wished to die. Against his wishes, they continued to treat his excruciatingly painful wounds because THEY felt they knew better than him. Well, Mr. Cowart is still alive today, and while (according to an interview I saw)he is now happy, he maintains that the doctors then should have respected his autonomy. In Canada, lack of informed consent could amount to a criminal charge of battery. It is true to say that the doctor has the information about the medical procedure to be performed but the patient is the only one with the information about his / her life and the consequences that success or failure of the procedure might have on that life. The reason for having the discussion leading to informed consent is so that the patient can make the most appropriate choice for his / her life. For anyone else to assume that responsibility for a competent adult is paternalistic in the extreme. Who is to say that the decision is wrong but the patient him or herself? The doctor should inform the patient of the risks and likelihood of those risks, in this case 2% risk of death, as well as the risks of the alternative (not having the procedure). The fact that the doctor disagrees with the patient's decision does not make it wrong. No, doctors should not omit information that is relevant to the decision making process. That is why it is called *informed* consent. Informed Consent is very important. Without informed consent people are forced into going through medical procedures in which their lives are in danger or there are alot of side effects. Many people see the options offered to them as a ray of light on their bad situation, However these options may just make the unfortunate situation more unbearable to live with. I personally would not want to go into a operation thinking the best and if I come out feeling worse than before. I understand that every option there is there are also side effects and possibilities it may not work, however the person recieving this operation should know of both the good and bad of the operation. With informed consent there would be fewer malpractice cases. It also would save alot of people alot of disappointment. Although it is incredibly painful to see a person decline proper treatment an place him/herself at increased risk. The patient's right to choose must be honored. We are obligated to educate the patient,in lay terms, about the risk/benefit ratio. This often requires a time investment (with the pt. ), something many physicians don't make. Unfortunately in our era of managed health care that time allocation per patient is shrinking and I fear that even less time will be spent in informing patients so that they are able to make reasonable decisions regarding their healthcare. I can understand your reasoning for wanting to bypass the patients informed consent. I believe that you are certain some patients are so frightened by the possible outcomes that may happen that refuse to have the MAJOR surgery. Regardless of the consensus of medicine and society that a certain procedure is clearly needed to save someone's life, the fact remains that the patient who is having the MAJOR surgery is the one who ultimately lives with the outcome (whether positive or negative)of that surgery. Therefore I would have to insist the patient be told ALL the POSSIBLE implications of certain procedures so that they are able to weigh up the pros and cons before the surgery is performed. It would be a sad day indeed, if after 60 years of decision making in my life, I was not given the information I deemed necessary to decide for myself what was to happen to MY body. Because a few Paternalistic doctors and society felt I would be to frightened by the possible outcomes of the MAJOR surgery to be given a choice. What a lot of rubbish. I decide what occurs in my life and never do I want to hand that decision over to someone else just because He/She considers themselves to be a better judge than myself. No ones has that right. There is many people willing to have this Major surgery so move on to patients who know the risks and are willing to take a chance, it is however their loss (meaning their worry ) no ones elses. I am struggling with your concern regarding disallowing informed consent procedures in the cases where you hypothesize that doctors have a clearer understanding of what the client needs are versus what the client feels and believes his/her needs are. I understand that medical science struggles with the difficulties within the concept of informed consent, but I do see your position as paternalistic and unwarranted. It is the right of the patient to decide what is best for their care as long as they can be considered competent to understand all information regarding treatment. It is your job to carefully explain the treatment to lessen patient fears. However, it is not your right to bypass patient concerns for their good. What is "good"? What is "best"? Only the patient has the right to those decisions. These are difficult concerns. I appreciate you bringing them up and please let us continue to discuss them. [The physician] believes that informed consent is not always in the patient's best interests. This suggests two seperate but related questions. The first is "How can we tell what is in the patient's best interests? The second is "Does acting in a patient's best interests override their right to self-determination?" Cardiac catheterisation entails a certain risk. People's attitudes to risk varies depending on the extent of the risk, and the meaning of the risk to that individual. Generally people are less willing to take risks that areimpersonal, out of their control, or technological. They may also refuse risks based upon cultural or religious beliefs. A good example is that Jehovah's Witnesses will accept the risk of death from refusing a blood transfusion rather than risk the spiritual "damage" due to a blood transfusion. In other words, when patients assess what is in their best interests, theyweigh up the risks, and also the personal meaning of those risks. This is not something that an outsider can do for them. Finally, even if a couse of action is not in a patients best interests (ie risky actions like parachuting or rock climbing), it is generally accepted that their right to autonomy over-rides the risks to their well-being. I understand [the physician's] frustration, but he must accept that other people place a different value on their coronary arteries compared to his values. I am an undergraduate philosophy and biochemistry major planning to enter an applied ethics and/or biomedical ethics graduate program. I do not entirely agree with this doctor's statement. The decision to not completely inform a patient about the risks of a procedure with low risks because the patient may refuse the treatment should not, I believe, be made solely by the doctor but by the persons most familiar with the patient who would be better capable of making such a subjective judgement about the patient. If such persons, as in the form of family or friends, are not available then I feel the doctor does not have the authority to withhold risk information. The doctor may ask the patient if they wish to know all the information or allow the doctor to do what is in their best judgement. By presenting the information in this fashion the patient obtains a sense of freedom and involvement in their situation which may lead to a build up of pysician/patient trust more conducive to persuasion if the patient initially refuses treatment. I feel this approach would be a better alternative in most cases. An Endless Kind of Sleep or Dead? "Recovery of consciousness from a posttraumatic persistent vegetative state is unlikely after 12 months in adults and children. Recovery from a nontraumatic persistent vegetative state after three months is exceedingly rare in both adults and children." The question I would like to pose now to my visitors is whether to consider a patient dead who has finally been diagnosed as in a Permanent Vegetative State? Another group of patients who are totally unresponsive and have complete and permanent loss of all brain function including the brain stem, can’t breathe and heart will stop despite artificial ventilation (“the brain dead”) are legally considered dead and are currently used as a source of organs for transplant. Should those in a Permanent Vegetative State be considered dead so that needed organ procurement from these patients can be permitted? These patients unlike those considered “brain dead” can breathe and may have a stable cardio-vascular system and appear as noted in the Task Force criteria above. In these patients, does the apparent fact that they will never experience the conscious awareness of themselves or others or their environment represent the death of their personhood? Or does the warm body with eyes opening and closing and breaths taken and heart beating as seen by the family and others absolutely preclude that this class of patients will ever be considered dead but that they are just in some form of an endless kind of sleep, never to fully awaken and live a life? ..Maurice. p.s. The photograph included in this posting was taken by me yesterday at the Los Angeles County Arboretum and Botanic Garden is that of a peacock. 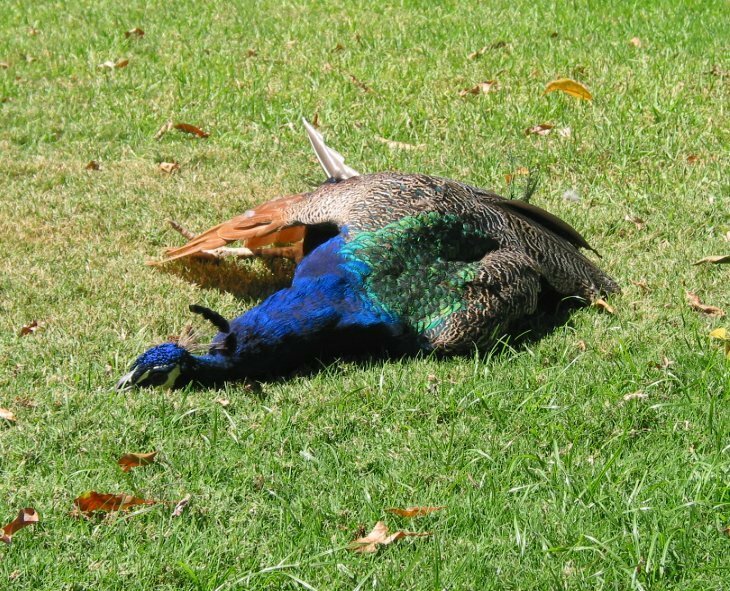 I have never seen a peacock assume this motionless lying down position and at first it seemed to me that it was dead but, indeed, as it finally got up and showed its feathers, it wasn’t! But is that possible and is that expected of physicians? Is anything less than perfection, even a mistake, an error, represent intolerable behavior and result for a physician? Are we held to a higher standard because we can hold life and death in our own hands? Is the physician's excuse a valid and rational one that making errors provides a means for the physician to learn. And where is the line drawn between a good and a harm? University of California School of Medicine Commencement 2005 Senior Address by Peter de Blank about making mistakes in medical school and in medicine. Should physicians take the view of the poet Dunbar and “count our joys” not by what our imperfect medical results have accomplished but only when we have attained the “miracle” our patients may desire? ..Maurice. As the 5th anniversary of the September 11th tragedy is shortly upon us, I thought it might be appropriate to copy to this blog a comment written by a visitor to my now inactive "Bioethics Discussion Pages", March 6, 2002. I would be most interested to read what my current blog visitors feel about the view expressed by Janet, particularly now, years later. ..Maurice. I visited your page recently for the first time in several months, and read with interest your piece on the September 11 tragedy. I'm thankful you concluded that our concern for other issues should not diminish because of this, but I find myself angry that the question should need to be asked in the first place, that people (not picking on you in particular!) continue to labour under the delusion that a large-scale, in-your-face tragedy somehow renders all other ethical issues irrelevant. It may perhaps help us get things in perspective and weed out some of the genuine trivialities that we've been stewing over, but it does not make all issues trivial. In the months after September 11 I had a number of people ask me how I could care about this or that when so many people had died. Those questions disturbed me, and a few weeks ago I read something by one of my least favorite newspaper editors on a different topic which helped me understand why. The editor was discussing the cruel live sheep export trade, and sanctimoniously told readers that their concern for the sheep would soon evaporate if they pictured children in this situation instead. Well no, dammit, it wouldn't. Two wrongs do not make a right. Some people may judge one wrong as being greater than another, but the lesser one does not then evaporate. Similarly, some tragedies are silent, chronic, largely hidden from the public eye, and eminently ignorable by well-off Westerners, but for all that they are no less tragic than September 11. To name just a few ... consider that thousands of third world children die EVERY DAY from malnutrition and easily treatable illnesses. That millions of people live in grinding poverty on the bare edge of existence with no chance to rise above their circumstances. That many more are killed, repressed and displaced by wars which have nothing to do with them. That slavery and torture still happen in many parts of the world. That thousands upon thousands of the so called "food animals" killed every year in our slaughterhouses are skinned and butchered alive and fully conscious because of lack of control and supervision on the production line. That thousands of healthy animals are "euthanised" annually for no greater crime than being unwanted by the humans who have supposedly taken on responsibility for their care. I would consider each one of these things to be a tragedy of "an unbelievable magnitude of maleficence", easily on a par with September 11. Perhaps even more so because of the very fact that, when they are acknowledged at all, it's usually with a shrug and an attitude of "I won't think about that because then I might feel guilty and have to change my comfortable life". These things are happening each and every day, causing a total of death and suffering far greater than September 11, but they don't make the headlines. Enough people who cared and who opened their hearts in the same way they did to the September 11 victims could make an unbelievable difference to many of these situations. I don't mean to make light of September 11 or the victims' suffering, but I freely admit it makes me angry that events like this are considered the epitome of tragedy against which all else is supposed to pale into insignificance. The real tragedy to me is the number of horrors in this world about which people don't care.